Hi, thanks for visiting my Patreon page! My name is I G Hulme and I created the Heavenfield, an epic series of dark science-fiction novels released as an award-winning audio-book. Please consider supporting my goal of working full-time on the Heavenfield series. Exclusive access to a new, ongoing audiobook! Your name in the Hall of Fame! Early release of the sequel audio-book. Advance access to the Heavenfield Datavault! Your name in the credits of future print books & audio-books. Free access to all current unlockable areas on the Heavenfield website! The Heavenfield has grown so large now that I don’t have the resources to work on all the different projects, but with your help I hope to fulfil my ambition of working full-time on the Heavenfield as an independent author. Every pledge you make – whatever you can afford, goes a huge way towards completing these projects, and each of you has my everlasting gratitude. My heartfelt thanks for your support! You are helping me create more of the Heavenfield. 1. As a patron of the Heavenfield you will gain access to the Patreon-only activity feed, where I'll post updates and news about what I'm working on - such as pages from notebooks, sketches, photos and other cool stuff! 1. Get exclusive early access to an all-new ongoing audiobook as it is written! The Diary of Otto Kandinsky. 2. You will also gain Early Access to The Dead Man's Feast Audiobook as it is completed! 1. Free access to The Heavenfield, & The Dead Man's Feast e-Books on the Heavenfield website. 2. Your name will go into the list of patrons on the Heavenfield website Hall of Fame (optional)! 1. Access to ALL the Heavenfield Datavault Sections as they are released (these are currently in varying stages of development, but the first section is available now)! 2. Early instalments of The Dead Man's Feast Audiobook as each chapter is recorded! 3. Occasional Special Content in the activity feed, exclusively for level $10+ patrons (such as the Soundtrack album)! 1. Elite Exiles will gain access to All Unlockable Areas on the Heavenfield website! This includes (but not limited to): The Heavenfield Audiobook, The Heavenfield & The Dead Man's Feast e-Books and The Dead Man's Feast Audiobook (when it is recorded). 2. Exclusive Early Access to ALL the Heavenfield Datavault Sections one release cycle ahead of public release*, to see them unfold as they are created! 3. Occasional Special Content in the activity feed, exclusively for level $25+ patrons (such as exclusive early access to new e-books)! 4. Your Name in the Third Novel! Elite Exiles will be listed in a special 'Thank You' page at the end of the print & e-book versions of the third Heavenfield novel when it is finished (minimum 6 months pledge at Elite level required). 5. Your Name in the Credits of the Audiobook! At the end of The Dead Man's Feast Audiobook I will record a special thank you, listing all the Elite Patrons (minimum 6 months pledge at Elite level required)! 6. 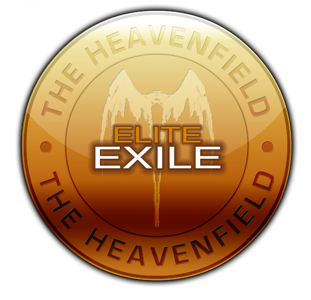 You will also be listed as an 'Elite Exile' on the Heavenfield website Hall of Fame (optional)! *these sections are currently in varying stages of development - the next in the release cycle will be Datavault Vehicles which you will gain immediate access to. When that is publicly released you will gain access to the next in the cycle - in this case Datavault Weapons, and so on. note: You must have been billed for your Patreon pledge at least once before you can redeem your print offers. Become a member of the Elite Exiles! $150 a month would really help take away some money pressures and give me some distraction-free time to continue the third book in the Heavenfield series.